Phyllis Helen Barnes was born March 2, 1924. She died November 18, 2017. She was proceeded in death by her dedicated husband James Barnes, sons Steve Barnes and Joseph Barnes and many other family members. She had 6 children, 23 grandchild, 36 great grandchildren and 2 great great grandchildren who continue to miss and love her each day. She will be truly missed. A Visitation will be held from 6:00 PM – 8:00 PM, Tuesday, November 21, 2017 with Funeral Services at 12:30 PM, Wednesday, November 22, 2017 at Bunker’s Garden Chapel, 33 N. Centennial Way in Mesa. 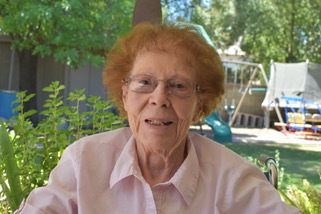 Phyllis is my grand-aunt and I will always remember her as the most loving and kind person. She loved her family with all of her heart and always looked forward to the time she could meet again with family who had a passed before her. I believe she is having the happiest of reunions today and I hope knowing this that her family is comforted.